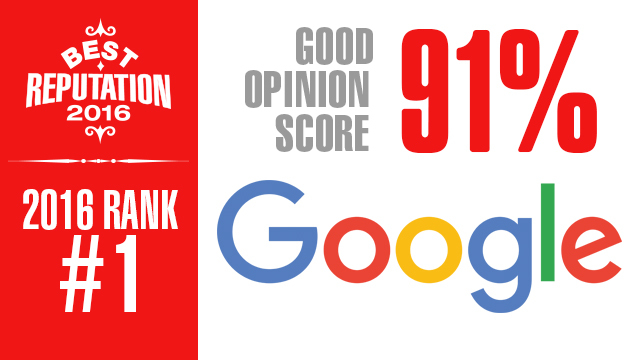 Google has once again topped Leger’s annual rankings of Canada’s most reputable brands. The tech giant has held the top spot on the list since 2013, when it edged out the previous year’s top ranking brand, Heinz. Leger’s rankings are based on online survey responses from January 2016 of over 25,000 Canadians, with 2,100 consumers answering questions about each brand. In total, the study looked at 225 companies. This year, Dollarama made its debut in the top 10, jumping six points from number 12 to number six. The discount retailer was one of three Canadian-owned companies to earn a top 10 spot. In terms of overall trends, Dave Scholz, managing partner at Leger, said the research group found brand reputation overall is improving in Canada. Last year, Scholz said there was a general drop in brand reputation, whereas this year there was a positive turnaround with “good opinion” scores for brands largely returning to where they sat in 2014. Google retains its number one spot this year, thanks in part to its status as what Schulich School of Business assistant marketing professor Ela Veresiu calls an “obligatory passage point.” Whether at work or school, Canadians use Google’s products on a daily basis to find information and connect with friends, family and colleagues. Google has become the Kleenex of search, having all but replaced a product category with its brand identity. It’s not just search, either – globally, Google now has seven products with more than one billion users, including Gmail, YouTube and Google Maps. That global footprint has helped cement Google’s reputation, Veresiu said. Being omnipresent isn’t enough to retain a stellar reputation, though. Google’s strength, Veresiu said, is its consistency. Consumers have come to trust the brand because of its batting record with useful, easy-to-use products. And when a product doesn’t work well or connect with consumers, Google usually retires it, which also helps the company maintain its positive reputation. Leger’s Scholz said Google has a stronghold on the number one spot. Unless the company sees a huge setback – or another brand has an unexpected surge – Scholz said he expects Google to remain number one on the list in 2017. When Heinz first announced it was closing its plant in Leamington, Ont., in 2014, Leger saw an approximate 5% drop in Canadians who said they had a positive opinion of the brand. However, the brand’s reputation has managed to bounce back. 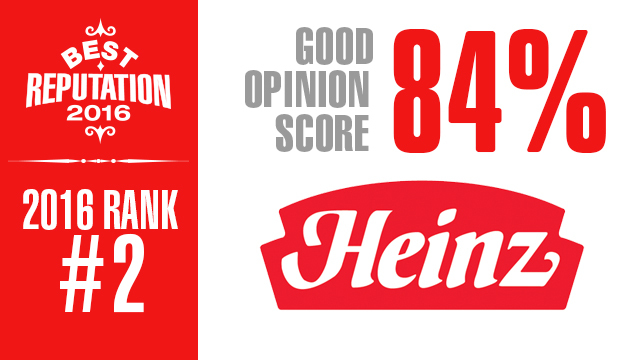 Overall, 84% of Canadians said they have a positive opinion of Heinz this year. Given all the negative buzz about the plant closure, Scholz said he was surprised to see the brand so high on the list this year (it has previously held the number one spot). While Heinz ranked well this year, Scholz said it’s facing increased competition ignited by the so-called “ketchup wars” that took place this spring, not long after the study was conducted. When Loblaw pulled French’s ketchup from its shelves earlier this year – a decision that was quickly reversed – it led to a groundswell of support for the company, which uses 100% Canadian-grown tomatoes. If French’s is able to hold on to the positive buzz it gained during that heavily publicized episode, Scholz said it may surge in terms of reputation while Heinz suffers. • Best Reputations 2016: Who lost ground? 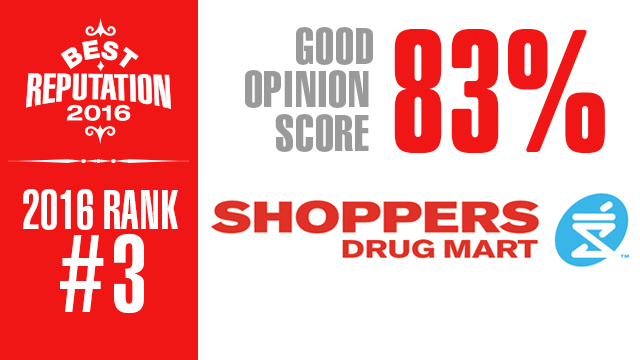 Shoppers Drug Mart is the top-ranking Canadian brand in Leger’s study this year. Luke Sklar, a partner at Sklar Wilton & Associates, a market research company with a strong stable of retail clients, said he believes Shoppers’ positive brand reputation is a result of its in-store experience rather than traditional marketing. Where Shoppers succeeds, Sklar said, is delivering an “effortless” shopping experience backed by its stable of knowledgable pharmacists and beauty experts. He added that in recent years, the retailer has also built up its reputation in the beauty market with its Shoppers Drug Mart “Beauty Boutique” sub-brand. The retailer has also successfully emerged from its its 2014 acquisition by Loblaw by slowly integrating key products from Loblaw’s President’s Choice label instead of suddenly flooding its stores with PC brand items, Sklar said. “I personally have been impressed with the way Loblaw products have been creeping into Shoppers without undermining or confusing the customer,” Sklar said. In recent years, Canadian Tire has undergone massive changes as it transitioned from a traditional brick-and-mortar retailer to a fast-paced, innovative and digitally focused company (efforts that landed it Marketing‘s Marketer of the Year honour in 2013.) Those moves are now paying off, with 85% of those surveyed now reporting they have a positive opinion of the brand. 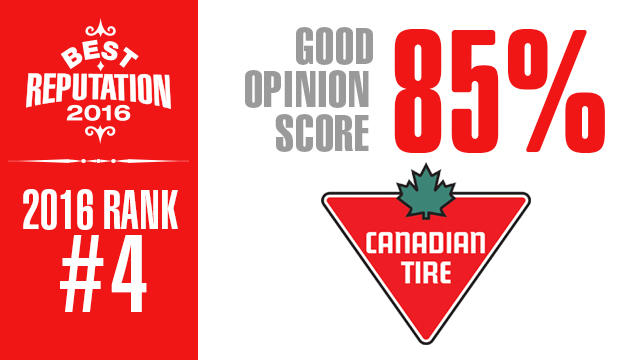 Sklar, who has worked with the brand for several years, counts Canadian Tire as one of his least patient clients, which he said is a major competitive advantage in the retail market. “They understand the retail world is moving faster and faster,” Sklar said. He points to the retailer’s recent reinvention of its catalogue as an example of its innovation mandate. The digital version of the catalogue makes great use of data and video, providing an annotated, interactive representation of the store’s offering. As the cereal market shrinks, Kellogg’s has gone to great lengths to adapt to changing consumer tastes. In January, for example, the company introduced six new cereal and snack products under its “wellness” brand designed to cater to consumers looking for products with real flavours and ingredients. The brand has also pledged to remove all artificial ingredients from its cereals and snack bars by the end of 2018. 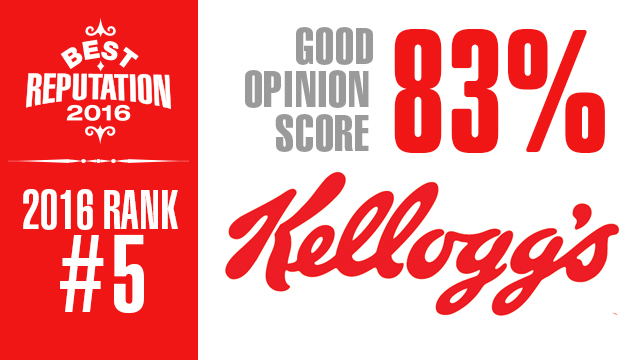 As it adapts to a quickly changing CPG landscape, Kellogg’s continues to benefit from years of built up trust amongst consumers. Leger’s Scholz said Kellogg’s high ranking is largely the result of its long history – its products have been part of consumers’ lives for so long that Kellogg’s is a name they now inherently trust. As noted earlier, Dollarama made a major surge this year from number 12 to number six. Sklar Wilton & Associates’ Sklar said the brand has earned its reputation by consistently delivering on its promise of affordable products and an easy shopping experience. 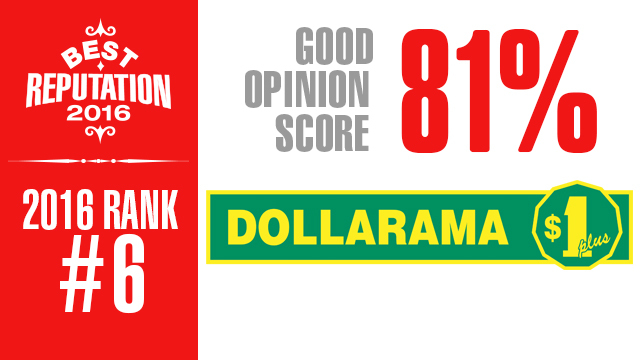 While discount shopping once meant digging through shelves overstuffed with dated or low-quality products, Sklar said Dollarama has managed to “bring dignity back to the dollar shopper.” Dollarama stores are clean, easy to navigate and consistent from location to location, Sklar said. This positive shopping experience has allowed Dollarama to grow its brand without investing heavily in marketing, Sklar said. He said the retailer’s reputation has also benefitted from bringing name brand products to its shelves. By striking deals with CPG brands to make smaller bags of chips to sell at a lower cost, for example, Dollarama has been able to provide consumers both with brand names they trust and prices that meet Dollarama’s low-cost promise. 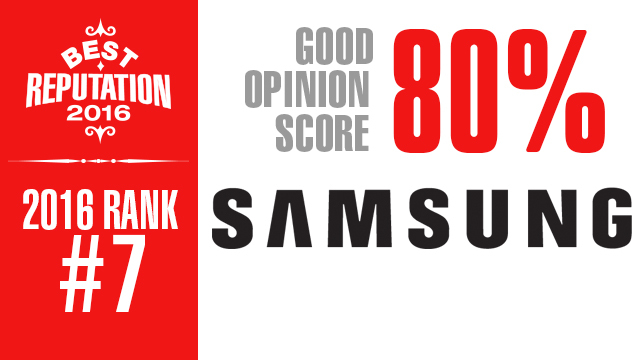 For Schulich’s Veresiu, Samsung’s high ranking on this study is a sign that “consumers are starting to question Apple’s omnipresence.” Indeed, Samsung ranked a full 29 spots ahead of its chief competitor in the mobile phone market. Though Apple may still be ahead of Samsung in terms of smartphone sales, its detractors have hurt its reputation score. Twelve per cent of respondents said they had a negative perception of Apple this year, compared to just 5% who have a poor opinion of Samsung. Veresiu said she believes Samsung’s positive reputation is driven by its Galaxy brand of smartphones. She said the company now competes head-on with Apple in terms of its product offering in mobile and has gained caché along the way. Backed by a large global ad spend, she said the company’s marketing – like its celebrity-studded Oscars ad this year – is boosting its reputation as a cutting-edge brand and a tech innovator. According to Leger’s Scholz, Kraft maintains its ranking in part thanks to the sheer number of products that carry its name. Because the company uses Kraft as its master brand and gives it prominent placing on its products, consumers have come to know the Kraft brand as well as they know its products. 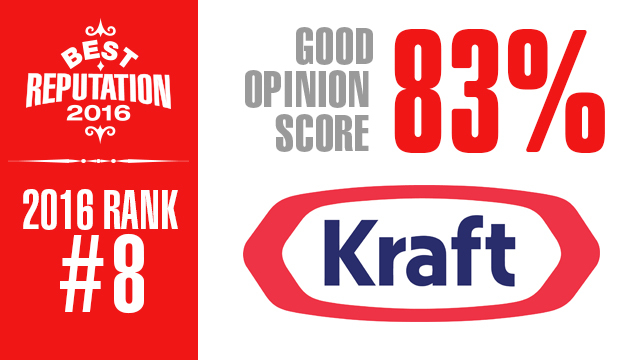 In terms of its advertising, Scholz said Kraft has recently done a good job of targeting specific consumers groups, like its recent campaign that used nostalgia to appeal to the older end of the millennial market. 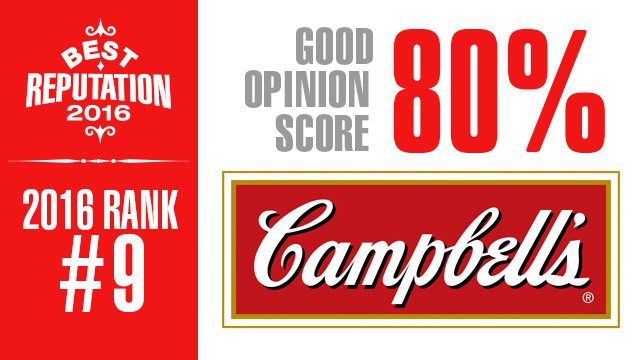 Like Kraft, Campbell’s reputation is boosted by its status as a master brand that appears on a whole suite of products, many of which have been staples for more than a generation. Campbell’s isn’t just resting on its history, though. Over the past year, the brand has branched out with its marketing by hosting a sample kitchen pop-up shop promoting its soups and re-launched its “Chunky” soup line in transparent packaging – a decision that’s proven to be a hit with consumers. Rounding out the list is Tim Hortons, which dropped from number two to number 10 this year. The drop should be a cause for concern for the quick-service restaurant, according to Schulich’s Veresiu. Tim Hortons, she said, is facing increased competition from both the high and low end of the coffee market. McDonald’s McCafe brand in particular is moving in on Tim Hortons’ dominance in the lower end of the market, Veresiu said, while other consumers are opting for higher end options like the Aroma Espresso Bar or local, independent coffee shops. If the brand wants to maintain its dominance in the coffee market, Veresiu said it must change its approach to marketing. The problem, she said, is that the brand isn’t fresh or hip, and too many of its ads are geared towards older consumers rather than the younger ones who represent future customers. This story can be found at: http://marketingmag.ca/brands/the-10-most-reputable-brands-in-canada-174142.